Being a typical girl, I love Valentine's Day - my boyfriend on the other hand isn't a true fan. He doesn't hate V-Day but thinks it's a whacked up holiday - his philosophy...."shouldn't I show you I love you every day of the year and not just one particular day in February?". Who can argue with that? But.....a girl likes to be wooed on the same day as many other girls are being wooed, so we can compare whose boyfriend or husband loves us the bestest! You've all been there...my flowers are better than your flowers or my candy heart has way more candy than your's does. The card I'm posting today is one I made last year. It's an easel card which I'm very fond of. I like making easel cards and giving them to special people who will appreciate them and want to display them for all to see...and easel cards make displaying them a breeze. Since this project was made last year I don't have all the specifics of the products that were used. I do know the pink paper that has the border all around was done with a Martha Stewart Punch Around the Page border punch set. I think it was called 'Eyelet Lace'. These punches are very easy to use as long as your paper is the exact size indicated in the instructions. The little girl was colored with Copic markers. My easel card is 6x6. Very easy to make. Take a 6x12 piece of cardstock and score it at 3" and 6". Fold it as shown above. Take a separate 6x6 piece of cardstock and decorate as desired. When adhering the separate piece to the card base make sure to only put adhesive on the bottom 3x3 piece of the separate piece OR just put the adhesive on the 3x3 folded section of the card base. Don't forget to put something on the inside part of the card to act as a stopper. I've used buttons, brads or just a sentiment adhered with pop dots﻿. Card folds flat for mailing. That's all for now....thanks for stopping by! Any Monty Python fans out there? I believe 'and now for something completely different' is one of the catch phrases from their comedy routines....along with 'nudge, nudge, wink, wink, Bob's your uncle'. I'm not a total fan but I must admit some of their stuff is hilarious while other things just go over my head. Oh well, enough about that....what I want to share with you today is something I find really fun to do. Over a year ago a customer came into Archiver's and asked if we had special paper and pens to do something called 'zentangle'. I had NO idea what that was and she brought up some samples on her phone. I must admit I was intrigued. I went home that evening and spent about 3 hours on the internet researching it. I found all kinds of websites showing tons and tons of different patterns. I went to Hobby Lobby and bought an artist's sketch pad and some fine tip black pens and started drawing all the patterns I liked. For those of you that have no idea what zentangling is.....it's pretty much doodling with a mission. You've all done it.....when you're on the phone with a pad and pencil, or when you're in a meeting with a pad and pencil...drawing little patterns all over your paper. That's zentangling. Here are some of the bigger zentangle pieces I did when I started in 2010. I get so excited when I find/learn something new that it becomes contagious. My manager at Archiver's got into it too (big shout out to Megan), she bought a sketch pad and was copying the patterns from my book. Then one of my co-workers (big shout out to Valerie too) got so involved with zentangling that she designed and created her Christmas cards. What's great about zentangling is that the only supplies you need are pad and pen. I carry a small pad with me when I travel that has all the different patterns I love and blank pages so that while I'm in the airport I can 'doodle' when the mood hits me. The whole thing about ZENtangles are they're supposed to be relaxing...I'm not quite at that point....while I do find it somewhat calming to do, I'm still a little amped up trying to figure out what pattern I want to put where...it's not quite the free flowing out of my fingertips relaxation yet....but I'm working on it. They also make great gifts...at least I think they do. I made this photo tray using ATC trading cards and drawing my favs on them for my Mother for Christmas in 2010. She thinks I'm really talented (no bias there, right Mom?) and wonders where I got this passion for all things crafty. That's all from the land of black lines on white paper....I'm in the process of designing my Valentine Day card - I'm up to three versions right now...so hopefully I'm zeroing in on something I'll be happy with. I'll be sure to share what I come up with in my next installment. Well, Christmas is over and New Years is now but a memory and we can sit back and enjoy what 2012 has to offer. For me personally 2010 and 2011 were difficult and trying years so I've got my fingers crossed that 2012 is a much better year. So far so good. It's now the 8th of January and where I live in the midwest we've had no snow to speak off. Only a slight dusting of snow twice this season. Of course I have just jinxed it and should probably send my apologies now to the entire midwest region....sorry!!!! Since we've just finished with some pretty busy holidays and I think it's too early to start posting Valentine's stuff....I think I'll just take a breather and post some cards that have nothing to really do with any holidays inparticular. 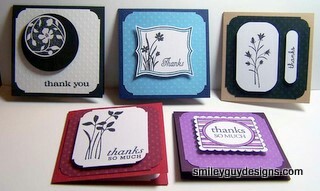 This first image is a set of thank you cards that I made. They are 3" x 3" cards and I just LOVE that size card. It's a perfect size to leave in someone's briefcase or lunchbox, etc. It makes a perfect little card to attach to a gift and even works well if you make a set to give someone as the gift. The stamps are a mixture from Stampin' Up's 'Just Believe' and 'Pocket Silouhette' sets. 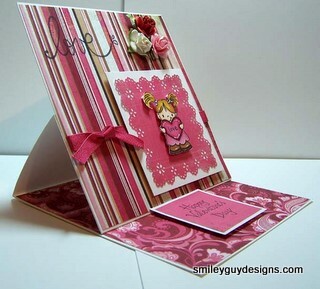 The scalloped background for the purple card is from a set I can't find so I don't have the name or vendor. The papers are from my stash of scraps. 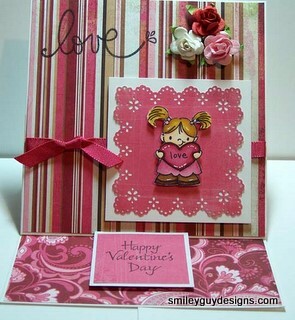 That's another thing I LOVE about these 3" x 3" cards.....you can use scraps to complete them. Woo-Hoo!!! The next image is one for our furry friends. 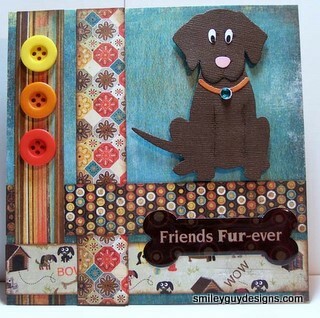 The dog is an older die cut from QuicKutz (now Lifestyle Crafts) and the papers are from 'Max and Whiskers' by BasicGrey. Isn't he cute???!!! And because every grouping is best handled in odd numbers.....here's a third image for you. 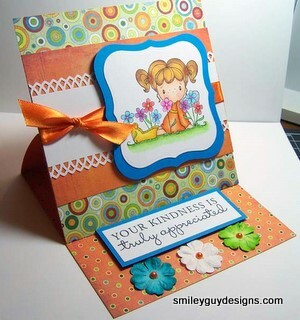 I believe the stamp is from CC Designs and her name is 'Heidi' - she's a pixie stamp and she's sitting in flowers. I had to buy this stamp because a) she's got my name and b) she's just so darn cute sitting the flowers with her little golashes. The papers are from 'Lime Rickey' by BasicGrey and the border punch is 'Arch Lattice" from Martha Stewart. That's all I have for you today. Thanks for stopping by. Have a great 2012!!!! !